From the moment students apply to college, until years after they graduate, they leave behind a trail of data. Usually stored in Student Information System (SIS) warehouses, this data captures a student’s behavior and performance as well as the choices they make on the path taken toward graduation. In the past few years, more robust statistical modeling and visualization software programs, have provided ways to not only better understand student success, but to also help students make better decisions throughout their progress towards degree completion. In 2015, IUB began to encourage instructors to use this big data through the use of Learning Analytics (LA), which is the “measurement, collection, analysis and reporting of data about learners and their contexts for purposes of understanding and optimizing learning and the environments in which learning occurs” (SoLAR, 2011). At that time, the Office of the Vice Provost for Undergraduate Education initiated the Learning Analytics Fellows Program (Fellows), a multidisciplinary research community made up of instructors from across the Bloomington Campus. Instructors can engage in their own scholarly research, using Learning Analytics (LA) to analyze student success in their courses, curriculum, and programs. In general Fellows’ research questions have focused on four broad categories of factors that may influence student success: choice, demographics, preparation, and performance. Often, these factors overlap and are interrelated in any given research project. Now entering its 5th year, the program is facilitated by IUB’s Center for Learning Analytics and Student Success (CLASS), with key data expertise and statistical support provided by the Bloomington Assessment and Research (BAR) office. To date, 42 faculty from 22 disciplines have conducted research, studying approximately 110,000 students and 3.8 million enrollment records. The access to such large amounts of evidence for research about teaching, learning, and student success has opened new avenues for how we understand our students, often dispelling anecdotal myths about who the students are, and why they make the choices that they do. 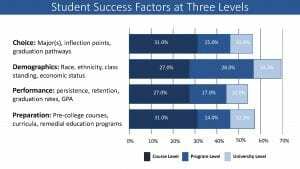 This has been especially true when it comes to understanding the influence large introductory and gateway courses may have on why students change majors or decide when to take general education requirements and prerequisite courses within a given program. For example, we often hear from instructors that the reason many students drop out of STEM gateway courses is because they’re not up to the task. However, when we study specific gateway courses, LA tells a different story. 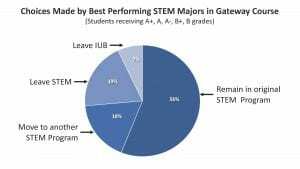 The pie chart below describes one such STEM course and the choices high performing students made after completing the course. It is noteworthy that 37% of IUB students with a GPA of B or higher either moved to another STEM department or changed majors after taking the course. An additional 7% of those students, who started out majoring in STEM, dropped out of school altogether. These are the type of questions Fellows are addressing with their research. Each year a new cohort of Fellows enter the program, as they join returning Fellows who have decided to continue their research and dig deeper into analyzing their courses and programs. Out of 42 Fellows, 17 of them have returned for a second or third year of research, and they are encouraged to do so if it is deemed appropriate. At the end of each project year, Fellows showcase their results at a campus-wide event. This year’s event will take place on Dec. 6, 2018 in the Georgian room of the IMU. The Program is open to all full-time IUB instructors regardless of rank. Each Fellow receives $2,000 in research funds, plus, if needed, a license for Tableau, a software that enables the exploration of data and the sharing of discoveries through the use of dashboards and visualization tools. The Bloomington Assessment and Research (BAR) office provides support to any Fellow who needs assistance understanding the student records data, and in creating using dashboards and other analytical tools within Tableau. The next round of proposals will be due on Dec 21, 2018. For all those interested in joining the program, an information session will be held on November 8, 2018, in the IMU Maple room. Additional information about the Fellows projects, including their project proposals and final reports can be found at the CLASS website. Read the recent paper about the Fellows program. The call for proposals is available on the CLASS website as well. Please contact George Rehrey to find out more about the Learning Analytics Fellows Program. George Rehrey , director of CLASS, is a former instructional consultant in the CITL.